10 strategies from the first spoons of feeding assist you to teach your kids how to eat well, and how to love foods. If you understand clearly the value of delicious foods which are good for health, you will not be more satisfied when looking at your babies to discovery joy of eating. But how to train a kid to prefer fruits to chips, and never ignore cauliflower and salmon? The short answer is: let start from now! Our taste is established very early, in general in a few years of the beginning of life, especially the first year – thanks to “advertisements” we receive. We are able to teach kids to recognize and be interested in many good foods. If missing this opportunity, kids will be picky eaters, only like their foods, and we will have to struggle to make them love fruits and vegetables more. Therefore, let catch this early opportunity. Here are 10 strategies beginning from the first spoons of feeding to help you teach kids how to eat well and how to love all foods. Some babies just don't like baby food. They must eat to grow, right? The best time for feeding your kids in the first time is when they feel the cheeriest and freshest that means in the morning or right after taking a nap. Be sure that your kids are hungry, not too hungry, and their elder brothers or elder sisters do not play around in order to make them distract. You should also turn off TV, and keep your cell phone in. 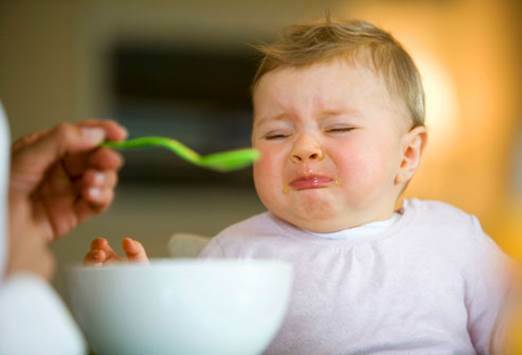 There are no rules for which foods should feed kids first, they can be cereals mixed with breast milk or formula milk. Banana and avocado seem easily transferring foods, but you can also begin with vegetables, or even meat. After beginning feelings, your babies may savor a few bites. When they turn head back, shake head, or become neglect; that means they feel enough. 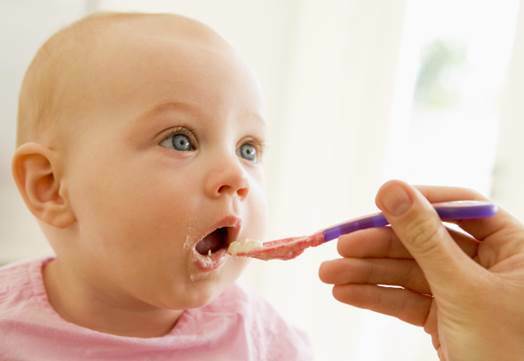 After your babies are familiar with eating, introduce them new kinds of foods immediately. Some experts advise that you should feed your babies the same food in a few days to easily find out reason if they have any bad reactions. Others suggest that you should introduce new foods for kids every day – and feed them mixture as soon as possible. Some experts said that using separate foods just teaches your kids to become picky eaters. Let use familiar foods to introduce new foods; if your kids like banana, mix it with papaya; if they like apple, grind it with blueberry. You should find out some funny ways in order to create next new foods for babies. They can base on 7 colors of rainbow, let think about guava, pumpkin, corn, green cauliflower, and so on; your babies will be tried many flavors and nutrients. Not success with carrot – let try again a few days later, and repeat if you feel necessary. Research says that among 4 mothers, there is 1 person giving up after their kids refuse to try a kind of food in 5 times or less. Research also shows that kids perhaps must spend 15 times trying one new food to accept it. “If you can convince your babies to try one food only from 6 to 10 times, there is much more opportunity to establish their love with it. To prove, in completed research, participants are required to feed their babies a purée with vegetables which they hate in many days in a row. After about 2 weeks, most of babies become to love this food”. When your children grow a little, let prepare for period when they do not like eating. And when your babies state that carrot which was one of their favorite foods before is “terrible”, change the way you cook such as grilling, stewing with meat, or steaming. If you want your kids to eat well, you need to have some private tips. Let eat! Your babies will taste what you eat through amniotic fluid and breast milk. Begin feeding kids. Signs express your babies are ready are they can sit independently and catch everything to put into their mouth. Let them be familiar with rougher foods. Studies showed that eating purée which is grinded too small exceeding the ninth month contacts with picky eating condition of babies later. Add more finger foods. While practicing ways to hold items by hands, kids will like using their hands to catch soft foods. Feed babies foods with many flavors. Experts say that if up to 1 year old, your children have not got acquainted with different favors; they will have tedious taste and be limited when growing up. You can let kids drink cow milk (pure milk), as well as honey. Their speed of growth begins to slow down considerably, so do their appetite. But you will see your kids like to put everything into their mouth. Use this period when your babies discovery positively the world around to introduce them new kinds of foods. At that time, babies can use spoon better. From this time to 3 years old, even the most enthusiastic kids also pass picky period (Darwin’s Theory of Evolution: this pickiness makes toddlers avoid eating strange fruits that can be toxic fruits). Let be creative and always change. It’s time to replace whole milk products by less fat dairy products.